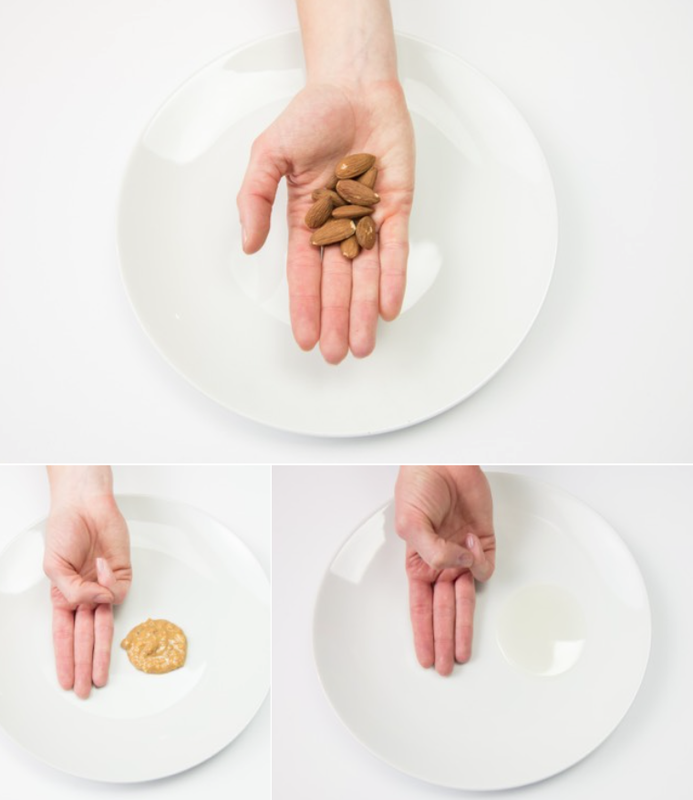 In this post, we're showing you how your hands can help you judge correct portions. The cool thing about your hands is that you take them everywhere! You have the portion control tool you need everywhere you go including restaurants, your in-laws, and your own kitchen. Fill up your plate with any non-starchy vege- table like salad, green beans, cucumbers. Starchy vegetables like carrots, potatoes and sweet potatoes should have a smaller portion as shown on the section. Remember these are plain veggies, so if you add any sauces, oils or dressing they need to follow their own portion control guidelines as shown to you in this post. Starchy vegetables like carrots and sweet potatoes are good for you but should be enjoyed in a smaller portion than non-starchy vegetables. Why? These guys have a much higher carbohydrate content than those leafy greens. 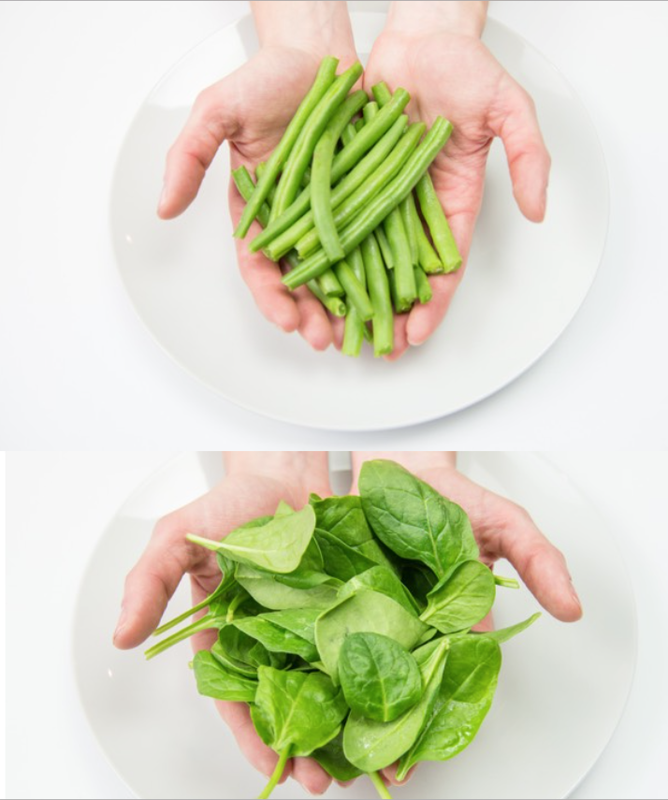 For example, one handful of sweet potatoes has 20g of carbs compared to less than 2g of carbs in two handfuls of spinach. Fruit is also great for you and it’s a delicious way to get the nutrients you need to thrive. However, the sugar and carbohydrate content is much higher in fruit than most veggies, so enjoy these with portion parameters in mind. I too often see my co-workers scarfing massive bowls of fruit salad (like massive!) at their desk in an attempt to “eat healthier”. However, the sugar and carbs in the too big of portion sent their energy crashing soon after and isn’t helping them get results. One handful of fruit typically has 15-20g of carbs and usually at least 10g of sugar. While the sugar is natural, it is still sugar so moderation here is important. Lean mean protein! For women I often find that the portions chosen of this macronutrient is not “enough”. Your protein portions from lean sources like chicken, lean ground turkey, and fish should cover the entire palm of your hand. Even enjoying lean ground beef, bison and fatty fish once a week in this portion is great for you! Grains are great for you! In particular whole grains like oatmeal and whole wheat bread, are an important source of many nutrients including fiber, B vitamins, folate and minerals. However these can quickly get out of control as plates loaded with pasta, rice and bread come by the basket! 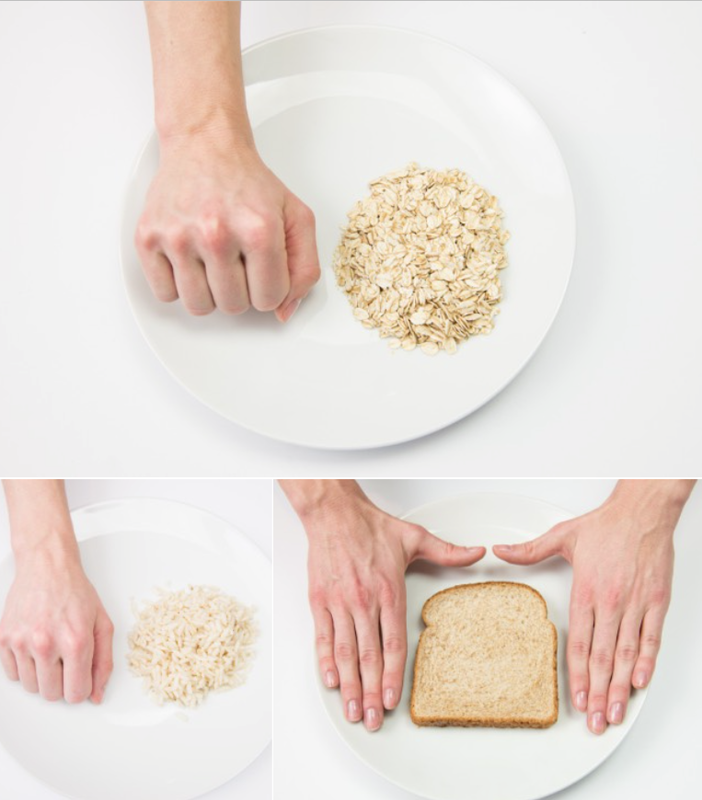 One fist or one small slice is a sensible serving of 20-25g of carbohydrates. Healthy fats have become well accepted as we know they pack amazing nutrition benefits, like better brain function and improved skin and eye health. However, the portion size of one serving of these healthy fats often shock my clients. Just 12-16 almonds is a “serving”. Next time count out those nuts, then look at the scant handful in your palm. Yup, that’s it. Most people are eating nuts by the large mitt full (after mitt full)! Nut butters and healthy oils like olive oil are similar. A spoonful is all you need. Newer PostHow Long Does It Take To Get Ready For a Fitness Competition?